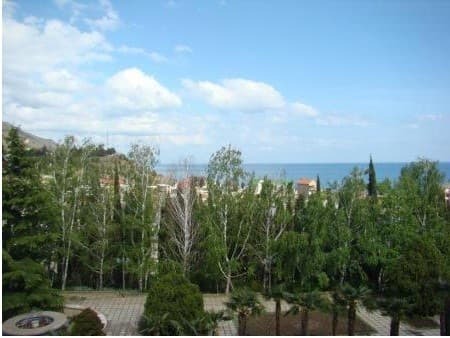 Pension "Rybachye" is located on the south-eastern coast of Crimea 30 km from Alushta, in a beautiful park area 150 meters from the wide beach, at the foot of the picturesque Crimean mountains. 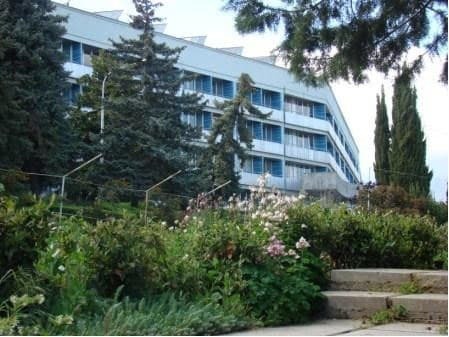 The decoration of the boarding house is its own park with Mediterranean plants, a rosary and shady alleys. One of the undoubted merits of recreation in the boarding house "Rybachye" is the presence of a wonderful natural sand and pebble beach. 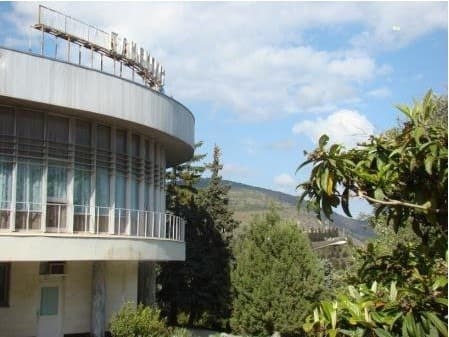 In the boarding house, a rosary, football, basketball and volleyball fields, a cinema-concert hall for 300 people, a medical center, a massage room, a bar, a disco, a cinema, a library, a billiard are available for guests. In addition, excursions to the most beautiful places of the Crimea are carried out. You can also make boat trips on the boat, visit the dolphinarium, and take part in the tasting of Crimean wines. 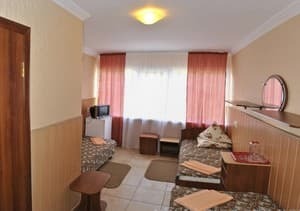 Description of the room: Room with partial conveniences. The room has a washbasin, toilet is on the floor, shower - on the territory. Cold water in the room, hot - in the showers near the hull. 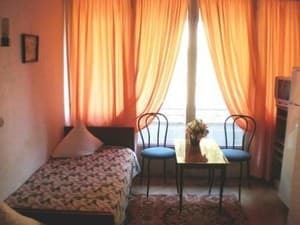 Description of the room: Double room with shared facilities on the block.General shower for 2 rooms. Cold water in the room, hot - in the showers near the hull. 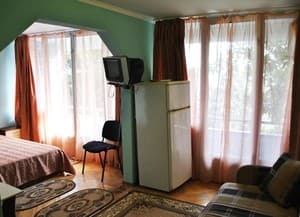 Description of the room: The room has cold and hot water. Description of the room: Room with all amenities. 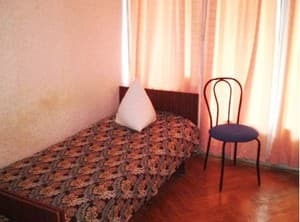 Children under 3 years without a seat and food are free of charge, from 3 years to 16 years in an extra bed (folding bed) in the parents' room - 35%. Accommodation of tourists over 16 years on a cot is not allowed. 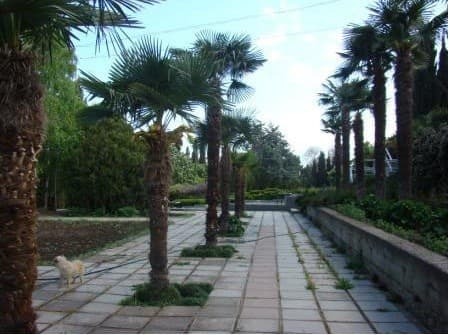 Pension "Rybachye" is located on the south-eastern coast of Crimea 30 km from Alushta, in a beautiful park area 150 meters from the wide beach, at the foot of the picturesque Crimean mountains. It is easiest to get there with a transfer in the city of Alushta. To Alushta from Simferopol, you can take the regular bus Simferopol-Alushta, Simferopol-Yalta, a fixed-route taxi or an intercity trolleybus number 51, 52, landing on which is next to the railway station of Simferopol (exit to McDonald's, in the direction of the clock tower). By car: when entering the Crimea, you get to Djankoy. From it, strictly to the south, along the M-26 highway, go to Simferopol (93 km). From Simferopol - on the highway M-18 and go to the Angara Pass, then a long picturesque descent to Alushta. At a large intersection in the city itself (landmark - Bus station on the right side) - turn left onto the P-08 highway. On it - another 35 km before entering the fishery.